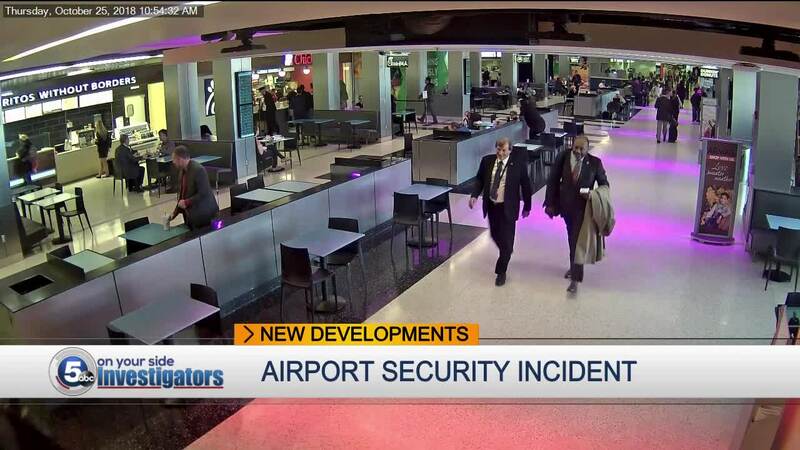 Newly-released records concerning an October security violation by Cleveland COO Darnell Brown and former Assistant Director of Port Control Fred Szabo shows the former airport official had a history of security violations. CLEVELAND — Newly-released records concerning an October security violation by two Cleveland city officials reveal former Assistant Director of Port Control Fred Szabo had a history of security violations, and that at least one security coordinator believed the city delayed notifying TSA of the breach because of who was involved. The City of Cleveland released three dozen pages of letters and internal records in response to a public records request by 5 On Your Side Investigators. Those records lay out an incident involving Szabo and the city's Chief Operating Officer Darnell Brown. According to an internal city investigation, Brown had already passed through security at Hopkins Airport when he realized he left his city cell phone in his car. The report said Brown "started to panic" and worried if he walked back to a hotel parking lot where he left his car to get the phone he would miss his flight to Baltimore. That's when Brown told investigators that he called Szabo. According to the report, Brown asked Szabo to take his keys to retrieve his phone. Instead, security video showed Szabo walked Brown through a secure area of the airport, then drove him out of the airport. Video shows the pair return minutes later. Szabo then walked Brown back through the secure area of the airport, bypassing TSA security screeners, and pointed him to his gate according to the video. Investigators said Brown boarded his flight without ever getting rescreened by security officers. That's a violation of federal regulations. Internal city reports show the violation was reported by an airport security manager. He told investigators that the violation was quickly verified. According to the city's investigation when that manager asked about contacting TSA to report it, he "was told not until they had a conversation with Fred." The city didn't notify TSA of the security breach until the next day. A security coordinator told investigators, "If it had been different players, it would have been done right away," according to the report. It wasn't Szabo's first violation of security protocols either. In a December letter to the airport's director, a TSA official wrote that the October 25th incident was Szabo's third in the last 24 month. "TSA believes that subject Szabo's airport issued access media should be permanently revoked as a result of his egregious actions which negatively impacted the security of our nation's air transportation system, the misleading statement(s) made by him to TSA within his Letter of Response (LOR) to our investigation against him and, the use of his position at the airport to dissuade proper security measures on the date of the incident," wrote Christopher Rascoe, Assistant Federal Security Director for the State of Ohio. Five days later the city announced Szabo was reassigned from his airport job to interim emergency operations center manager. He was also suspended for 10 days without pay and had his airport security credentials permanently revoked. Brown was suspended for five days without pay. TSA, which could have fined the city more than $13,000, issued Cleveland a "warning notice," and noted "a repeat incident of this type would be an extremely serious matter and would call for a more severe sanction." According to its internal report, Szabo told city investigators he was "profoundly remorseful," that it's "part of his DNA to help people," but that he "knows better" and that his actions were "inappropriate."